The photo was taken with a Nikon D7100 + Sigma Art 18.0-35.0 mm f/1.8 lens using the following settings: f8 ISO 200 @1/250s. All photographs hosted on worldisbeautiful.net servers are copyright by the original authors of that content. It is licensed only for personal use on computers, cellular phones, and other personal electronic devices. All other uses (whether or not for profit) including redistribution (with or without modification of the original work) is strictly prohibited by law without additional written permission by the copyright holder. Kravica waterfall, often erroneously called Kravice, is a large tufa cascade on the Trebižat River, in the karstic heartland of Herzegovina in Bosnia and Herzegovina. It is 10 kilometres (6 mi) south of Ljubuški and 40 kilometres (25 mi) south of Mostar. Its height is about 25 metres (80 ft) and the radius of the lake in the base of the waterfall is 120 metres (390 ft). 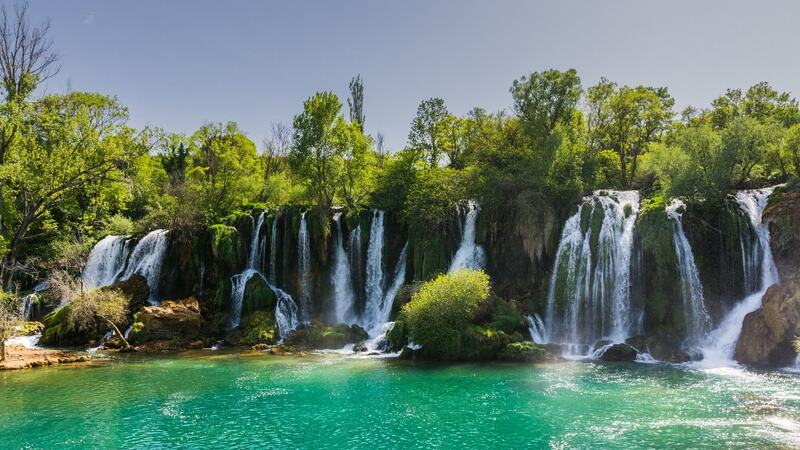 Kravice is a popular swimming and picnic area and, during the summer, it is frequently visited by tourists from Mostar, Medjugorje and Dubrovnik. The Kravica Falls area also has a little cafe, a rope swing, a picnic area, and a place to camp. The best time of year for visiting is during the springtime when the fall is at its fullest and the arid landscape turns a bright green. During the high season, various restaurants in the vicinity of the waterfalls mostly offer grilled dishes and fish specialties. Near the Kravica Falls is also a small grotto with stalactites made of calcium carbonate, an old mill and a sailing ship. The owner of the waterfall was the famous municipal councilor, landowner, benefactor and philanthropist from Ljubuški, Zaim-beg Selimić.